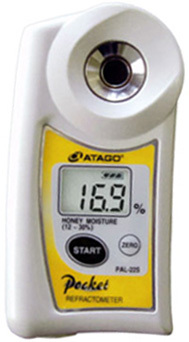 Digital Hand-held Pocket Honey Refractometer. The PAL-22S Honey Refractometer is the best way to check the %water content in honey. A Necessity for Bee Keepers, Honey Packagers and Dealers. The Pocket Honey Refractometer, PAL-22S, can measure the % water content of samples easily and display readings digitally. Comfortable, easy to use, light and compact. Measurements can be taken anywhere. RE-39409 PAL carrying case (PAL series refractometers / salt meters) P.O.R. Additional Items: Click HERE for a list of even more Pocket Pals!